Our haul out in Trinidad was delayed until the late afternoon and the hoist operators were in a rush to get Lynn Rival shored up. As soon as we motored into the holding dock and passed our lines they brought in the hoist, arranged the straps and lifted Lynn Rival out of the water, with us still on board. It was a very peculiar experience being driven into the yard along the rows of boats and seeing them at deck level. Normally we are encouraged to disembark at the holding dock and walk. The boatyard is big but was full of boats there for the hurricane season so we were placed temporarily at the end of one alley, blocking others' exit. Lynn Rival would need to be moved more than once before being settled in her final destination. Oh - we're causing a traffic jam! We had a busy few days preparing to leave, including writing the usual lists of spare parts to buy in the UK and also checking out local suppliers. While in the marina we'd already met up with a few cruisers we already knew, including South Africans Wayne and Tracey who we'd met in Rio de Janiero and Gavin and Georgie who have a Rival 41. Once in the boatyard boat owners kept popping by to introduce themselves and chat. 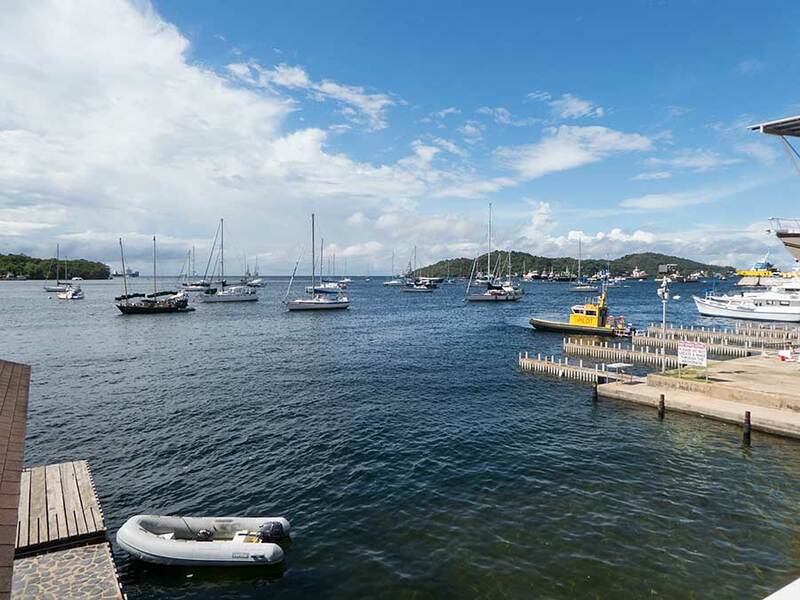 Chaguaramas is a very cosmopolitan place, with yachts from all over the world as well as local boats, including those serving the oil industry here. The boatyard organised the necessary paperwork: letters for the local Customs and Immigration offices to stamp (which we then presented at the airport on our return). All we had to do was get to the airport which, in theory, is under an hour's drive away. However, because the roads around Port of Spain are often jammed in the afternoon we were advised to allow almost 3 hours. We ended up hanging around the airport longer than we'd like but the 9 hour night flight back to Gatwick was comfortable and on time. Our six-week visit was the usual hectic mix of shopping for the boat, medical check-ups, visits to friends and family, etc. The weather was quite mild when we arrived, so not such a shock after the tropics, but the almost continuous grey skies soon made us long to return. We did have a lot of fun, enjoying all the things we miss abroad like eating toasted crumpets and, of course, watching Strictly. We were not total couch potatoes, managing to help Helen build a shed in the back garden just before we left. 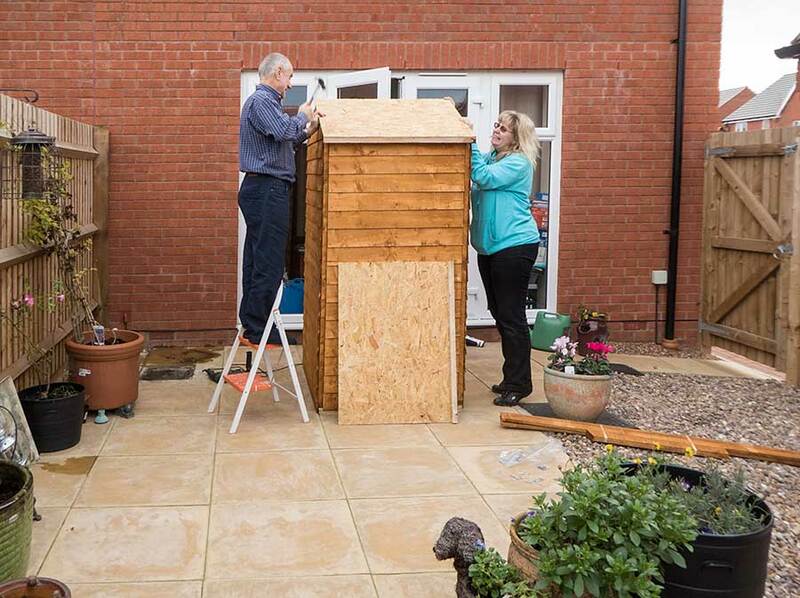 We've used too much storage space inside - so we helped Helen build a small extension! Our flight back to Trinidad was also on time so top marks to Caribbean Airways. However the long queue for Immigration was exasperating. At Customs we had to declare all the boat parts we were bringing in. 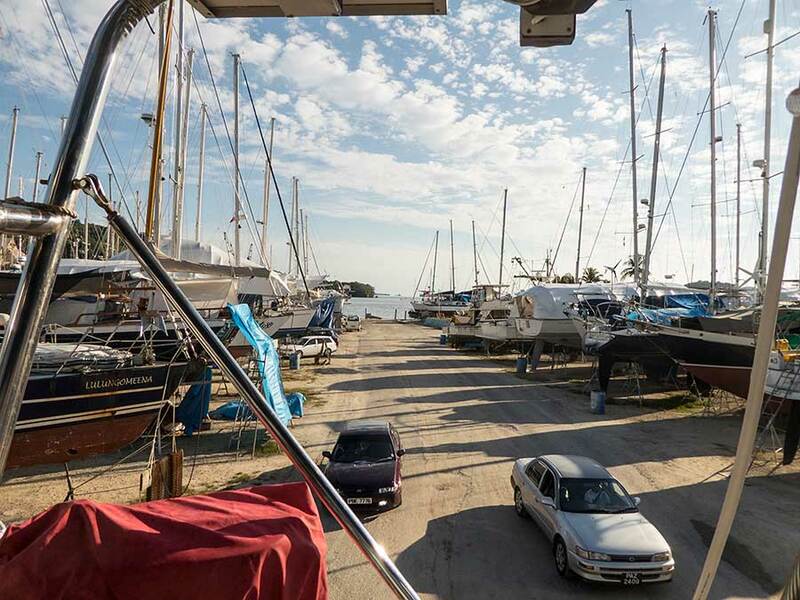 There is no duty to be paid on spares for foreign yachts but they don't want you selling them into the local market. After finding the right office, presenting them with a list and showing them our bags we were given a piece of paper and told to go immediately to the local customs office at Chaguaramas. The next step was car hire and we soon took charge of a cheap and cheerful old banger. Having been shown where the spare tyre is located in the boot we loaded our bags on top and drove off into the night. We are not familiar with the roads and the signage isn't great but with the help of Google Maps on Rachel's tablet we found our way through Port of Spain and out to the north west of the island. The official on duty at Chaguaramas customs looked over our paperwork and asked to see our bags. It was then that we realised we had no idea how to open the boot. It was hard to see in the dark but we tried pulling and pressing everything we could find around the driver's seat and wheel. Nothing would work (and we were worried about breaking things in the process of pulling and pushing what is already well worn). We explained our dilemma to the customs official who came outside with a torch and also tried to find the catch - to no avail. Eventually she gave up and, having already completed the paperwork, signed it off and sent us on our way. We found Lynn Rival a bit dirty from the rain but fine inside. No ants or mildew. However, we won't be launching her for a while. Apart from various maintenance items like servicing the seacocks we do have a major problem to resolve. All is not well with Lynn Rival's bottom. When we launched just over 3 years ago we had the hull slurry blasted, then layered with epoxy and finally Coppercoated. 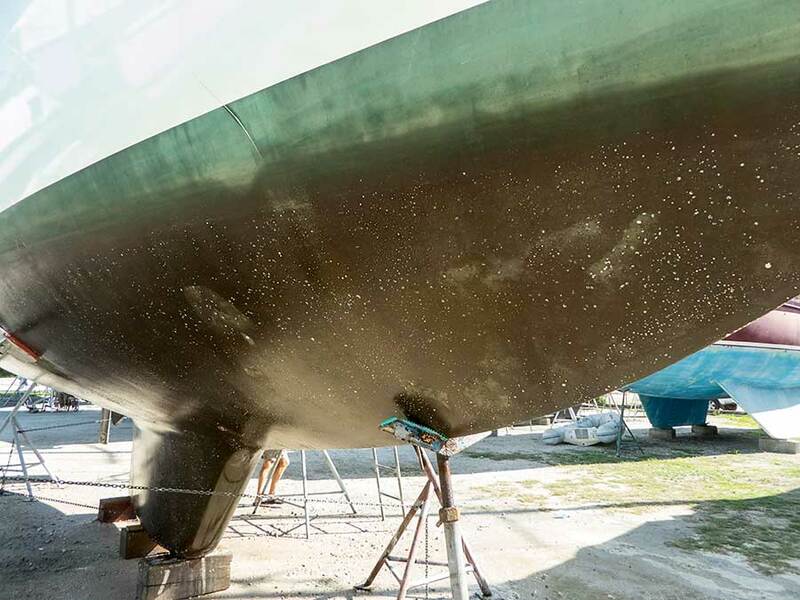 The Coppercoat is marvellous because it reduces hull growth, is easy to scrub clean and should last at least 10 years. 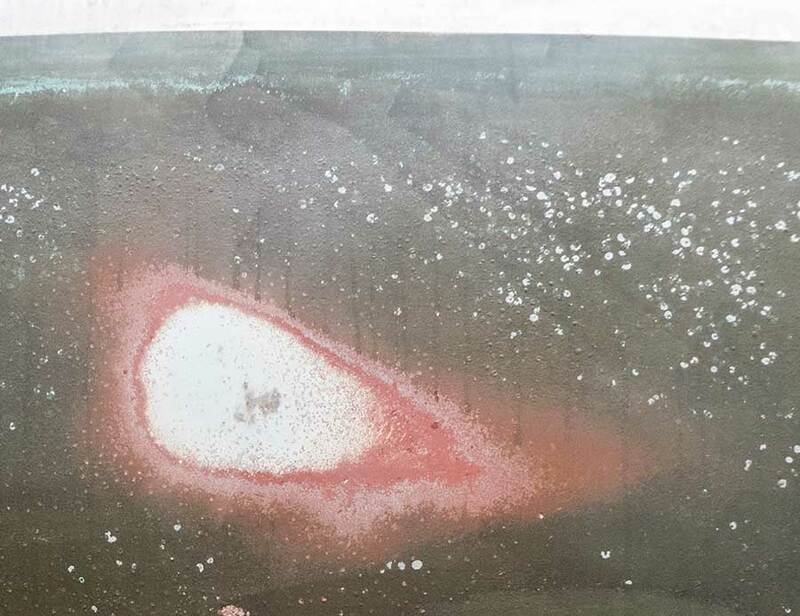 Unfortunately the bonding between two of the epoxy layers has failed, allowing the creation of small bubbles that burst when the hull is scrubbed, exposing the grp. The only solution is to take it all off and start again - a lot of work, especially in the Trinidad heat. 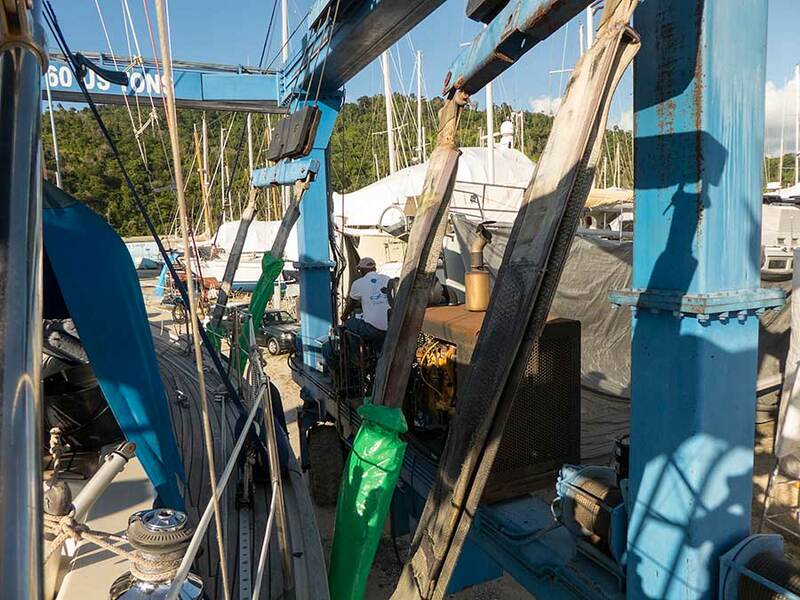 Fortunately Trinidad is a good place to get work done with a choice of local contractors specialising in all the different services needed for yacht maintenance and well-stocked chandleries. We've engaged someone to work on the hull while we get on with all the other tasks we've set ourselves. We're getting acclimatised, including an early start to take advantage of the morning cool, and finding our way around. Apart from chandleries there are small shops, bars and restaurants in Chaguaramas. However, some things are only available in Port of Spain, about 20-30 minutes drive away. Since the beginning of December the boatyard has thinned out. Many of the yachts that were here when we arrived are now heading north, up through the eastern Antilles. Plenty of the remaining yachts are being worked on by contractors and/or their owners. Our immediate neighbours are Brazilian, doing some extensive repairs to their bow. We're slowly getting the hang of communications. Having struggled with Portuguese and Spanish for much of the last 3 years it's a relief to be somewhere that uses English. However Trinidadian English has it's peculiarities. And they speak so fast we're forever having to ask people to slow down. But they do love to chat so it's easy to make friends if you're a good listener. Christmas is coming and we won't have Lynn Rival launched before then. Lynda is coming to join us and we're flying to Tobago to do some liming over the holiday season.